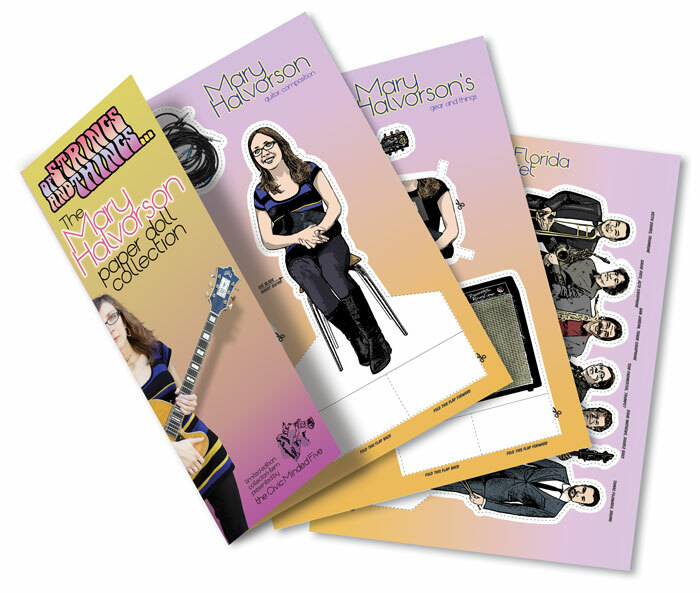 Mary Halvorson paper doll set- What? $15 keeps the cm5 booking shows and designing ephemera. Commodify the avant-garde and raise funds for the cm5 and the Atlantic Center For The Arts simultaneously! After the (relative) success of our Peter Brötzmann-inspired Machine Gun Pepper Sauce, the emboldened aesthetes at the cm5 present our next premium, again courtesy of the desk of our own Jim Ivy. It’s the Mary Halvorson Of Strings and Things paper doll set. This limited edition three sheet set includes accurate depictions of Mary’s guitars, pedals and amp. Playtime becomes instruction time! Page three includes drummer Tomas Fujiwara and five hard-hitters from the Sam Rivers Rivbea crowd. Do you admire Anthony Braxton guitarists? The cm5 or Atlantic Center For The Arts? Jacques Derrida? Set aside fifteen of your U.S. dollars to give and get, citizen philanthropist. Reserve now and pick up your set at the concert. Or see your cm5 authorized dealer on Monday, July 1st. Tags: Atlantic Center For The Arts, Civic Minded 5, cm5, Mary Halvorson, paper doll, Timucua white house. Bookmark the permalink.